Such gentle colors and I love the flower on top! This is absolutely gorgeous! You did a beautiful job showcasing the beauty of this stamp and also using the sketch! Thank you for joining us in the DeNami challenge- we hope you'll play with us again! Beautiful card! Great colors...and the flower looks really nice on top of the cake! Gorgeous ... love the soft pink with the black and white. Great combo! Very elegant card with the pretty heart ribbons and rose. WOW!! That is sooo pretty!! LOVE the words hidden in the frosting! And the pretty peachy shimmer is delish! Oh, so lovely!! This is an absolutely delightful celebration card. I love your gorgeous cake! Thanks for playing in our Anything Goes challenge!! So sweet and innocent! Love these subtle colors and the beautiful ribbon treatment...Thank you for joining us at The Paper Players! You're getting brave and your card is delicious, Shirley! 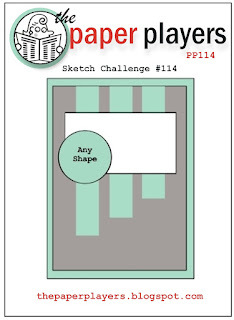 Very cool take on the sketch challenge! Fabulous combination of challenges! Wow! You created such a pretty card! Love the pink and ribbon!